There are a myriad of reasons why, according to IDC (via Bloomberg), Apple saw year-over-year sales of the iPhone drop 19.9% in China during the calendar fourth quarter. During the three month period, the American company had the fourth largest smartphone market share in China with 11.5%. First of all, there is the U.S.-China trade war that has negatively impacted the Chinese economy, and has driven the Yuan lower against the U.S. Dollar. Because of the strength in the dollar, the Apple iPhone XR was more expensive to Chinese consumers than the Huawei Mate 20 Pro (Apple later cut wholesale prices to adjust). Then, there is the arrest of Huawei CFO Meng Wanzhou in Canada. The arrest was based on a U.S. warrant that alleges the executive (and daughter of the company's founder) engaged in global bank fraud in order to cover up illegal sales to Iran. This touched off a wave of nationalism in China that has local companies punishing employees who buy iPhones, while subsidizing the purchase of employees' phones made by Huawei and other domestic brands. And we shouldn't forget the preliminary injunction that Qualcomm won against Apple from a Chinese court that found Apple liable of infringing on a Qualcomm patent. That sales and importation ban covers the iPhone 6s through the iPhone X. Of course, the entire smartphone market is stagnant at best, and with many of the latest innovations coming from Chinese manufacturers, Apple had the fourth highest smartphone market share in the country. 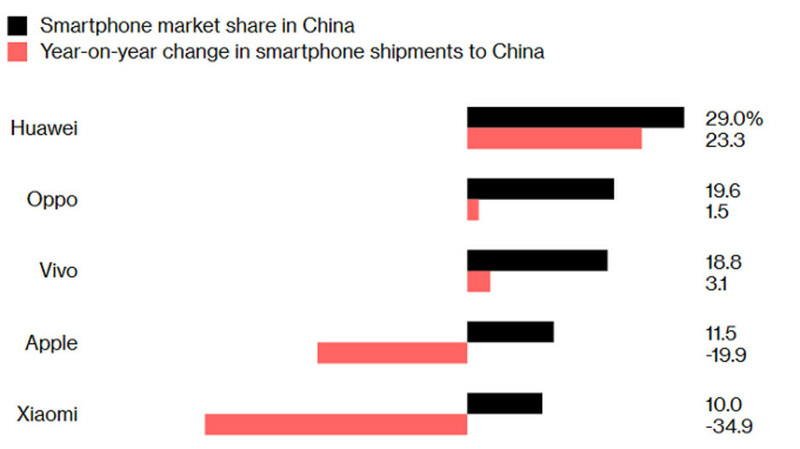 On top is Huawei with a leading 29% slice of China's smartphone pie from October through December, 2018. The company shipped 23.3% more handsets than it did during the same quarter in 2017. Oppo and Vivo were second and third, with market shares of 19.6% and 18.8% respectively. Both showed slight gains in shipments year-over-year. Xiaomi, while shining brightly in India, was fifth in its home country with a 10% market share. Its shipments declined 34% in the country year-over-year. https://www.scmp.com/news/china/diplomacy/article/2185085/eu-ban-chinese-technology-5g-revolution-would-hit-trade "At least five EU governments – France, Germany, Poland, Britain and the Czech Republic – have said they are investigating whether to bar Huawei from 5G infrastructure developments. One of the concerns cited by European nations is that Chinese law demands private companies and individuals cooperate with national intelligence agencies – meaning Huawei could turn sensitive data over to the Chinese authorities. It's not only in US, this will be interesting to follow, it's getting bigger and bigger and it's interesting to see if there's any truth behind it. What's the big deal? It was good enough for apple to comply in order to do business in China. Blackberry also gave Pakistan servers to allow them to spy on their own citizens. Hey. Thanks for the clarification on that. Already forgot about PRISM and Snowden? That gap is only going to widen. Now that all the top dogs offer better quality phones for a lot less. It's also a fact that all of them are innovating and bringing fresh new concepts unlike LG, HTC and Apple.